Below is a front page article (1/26 Roanoke Times) about our local library system. Most of you won't care, but its a real problem here. The Raliegh Court Library next to Patrick Henry High School is 1/2 a mile from my house. After school 3-4 students will gather around a computer staring at indecent photos, posting and making wierd and vulgar comments. When they are asked to be quiet they cuss the librarians, and they complain that they get strange looks. Whatever happened to being quiet in the library? Anyway... I know y'all won't care, but I'm just happy that the media is finally picking up on this problem. Alot of people in the neighborhood have been trying to solve this problem for over a year. With nowhere else to go, students socialize among the stacks. During geometry class at Patrick Henry High School, a group of friends often joke with one another about what they'll do after school. "Are you going to the homeless shelter today?" freshman Alex Talin will ask her friends. Talin and her pals are referring to the Raleigh Court Library Branch, which is adjacent to the school. The girls go there almost every day because they have nowhere else to go while they wait, sometimes for hours, for their parents to get off work and pick them up. The girls and a dozen other students congregate in and outside the library, chatting and using the computers. They can get loud, and others in the library are sometimes frustrated that it's not the quiet place they expect it to be. The Raleigh Court branch is one of many in Roanoke that acts as an after-school day care of sorts. Like all branch libraries in Roanoke, the Raleigh Court branch is next to a school, making it easily accessible to students. The Salem Public Library, too, is overwhelmed with as many as 40 students after school. "I feel like it's an ad hoc teen center," said Janis Augustine, director of the Salem library. Because the librarians have to keep an eye on the students, they can't work as efficiently, she said. "It's somewhat frustrating because I know the kids need a place to go and blow off steam. They really don't have any other place to go." The Salem library is working with the city, schools and police to address the problem. Last school year, Salem DARE officers began patrolling the library a few days a week, said Lt. Tim Guthrie of the Salem police. "The biggest thing is the kids just become loud and disruptive for a library setting," Guthrie said. In Roanoke, school resource officers will assist the library with disruptive students, but it's the library's responsibility to manage the students, said Officer Rodger Hogan, a resource officer at Patrick Henry. "We're not the Dewey Decimal detectives," he said. Not all students cause problems. But others make it obvious they're not there for the books. "I don't even really like to read," said Danikka Laya, a Patrick Henry freshman. Most students go online, updating their myspace.com pages, playing computer games or checking out the latest cellphone accessories. They gather around computers, laughing and pointing at pictures. Others loiter outside if the weather's nice, catching up with friends or sneaking a cigarette. One patron, Mildred Weddle of Roanoke County, said she enjoys being around the children and hearing them laugh. One even helped her when she had car trouble Thursday. Another patron, though, said she avoids the Raleigh Court branch library during after-school hours because of the students. "They take up all the computers and there's nothing for the little kids to do," said Sheila Pauley, a mother of two. Patrons and librarians may voice their displeasure, but the library is a public place. Librarians or officers can ask a disruptive student to leave, but their only other methods of enforcement are stern looks and verbal scoldings. "The librarians freak us out because they just kind of stare at us," Talin said. "They are not really polite." Signs around the library also seem to hint that it's not OK to use the library as a day care. "No trespassing," read signs mounted on the outside of the Roanoke libraries. Another sign, this one posted near the checkout counter at Raleigh Court, advises that, "Although we are concerned about the wellbeing and safety of children, Library staff cannot assume responsibility for care or supervision of children ..."
For parents, though, it is a comfort knowing their kids are in a safe place. "I would prefer her to be here than out running around the block getting into trouble," said Joan Novoa of her 14-year-old daughter, Kelly Considine, who usually goes to the Williamson Road branch after school. Sheila Umberger, director of Roanoke libraries, said she is thrilled that the students come to the library and wants to do more to accommodate them. "It's very important for our kids to be respected and given a place to be," she said. She acknowledged that their presence can create a problem for librarians and patrons, and she said the library is working toward solutions. The Roanoke library is collaborating with school officials and resource officers to set guidelines for the students. One solution the Raleigh Court branch and police have recently put into place is a barring program. If a student is disruptive, police are called and give the student a form banning them from the library. If the student returns, he or she could be charged with trespassing. Hogan said no students at the Raleigh Court branch have been charged in the two or three weeks the program has been in place. The Roanoke library is also adding a security guard to its staff because Umberger believes it will help patrons feel more comfortable. "We want to make the location a good one for everyone," Umberger said. Umberger said she would like to provide the teens with more multimedia activities, such as listening stations and laptop labs. "We want to make it a cool place," she said. Some branches have already taken steps to accommodate students. The Williamson Road branch has rearranged computers to create separate stations for adults and students. The Gainsboro branch created a teen club, Gainsboro Truth, whose members participate in programs that cover topics such as building character and respecting the library. The main library is in the process of establishing a teen center, which should be in place by summer. "We've always encouraged kids to come in," Umberger said. "When I look at it, we're just trying to improve our services." Currently Virginia's senior senator, John Warner, is working on a non binding resolution to oppose the president's troops surge. No matter what happens, the troops surge will take place. Warner's non binding resolution will simply tell the soldiers who are a part of the surge, we don't support you. On the concept of a troop surge, Lindsey Grahm accurately said the following. “I believe General Petraeus’s new strategy of sending more troops and more economic aid, and improving the political climate in Iraq is our best chance for success, and I support his new effort. To my colleagues who believe Iraq is a lost cause, I urge you to have the courage of your convictions and vote to stop sending more troops into Iraq by cutting off funding." If you also want to see the U.S. Senate support our troops in combat, please go to http://www.thenrscpledge.com/ sign up, and call your senators. No matter who you are, how old you are, or what your age, your voice and activism will help. 2. Healthcare and Education: Even though I doubt much of what the president said concerning these subjects will be heeded, I loved watching the Democrats grimace when the president said the word "privatization"
3. Energy: The president's proposals on the subject were nice, but all demanded more government intervention, regulation on fuel types and standards, and increasing SPR. I was waiting for the president to say, "...and as we actively pursue the development of alternative fuels we need a steady supply of non-mideast oil. That's why I'm once more reccomending that you open up ANWR and the OCS to drilling." 4. Judges: The president once again called for the speedy confirmation of judges. It's definitely an important thing. The lack of judges is holding up the courts. The fourth circuit is missing one third of its members. However, its a little to late. Thanks to eh incompetence of Frist and antics of McCain and co. the constitutional option was never exercised. with Leahy in charge of the judiciary committee things will go at a murderously slow pace. Also... Can anyone explain why the issues of judges wasn't campaigned on in the midterms as it was in the president's reelection? Might it have done more to galvanize the base? 5. Protection of Marriage: You may see this and think, "Did the president even mention marriage in the speech? If you are that's my point. It seems to me like the FMA was a political ploy campaigned hard on in the president's reelection campaign to galvanize the base, but practically ignored in the last two years. Sorry... It was voted on in the summer by congress in an attempt to show conservatives that teh Republicans are conservative to. Why couldn't the president throw in two lines about the FMA? 6. Immigration: I'm sorry. I have totally had it with the president on immigration. Instead of cozying up to your non-base, can you just keep this country safe Mr. President? 7. Iraq: It's really simple. We need to win. Sadly the Democrats and the RINO's are invested in our defeat. If you don't believe me go back and watch the video of the speech. Every time teh president mentioned victory in Iraq, the Democrats sat on their hands. How can people who don't even want us to win help create a constructive proposal on the subject? Ironically even though the D's oppose victory in Iraq, they cheered wildly whenever teh president encouraged us to support the troops. Explain that one please. 8. Senator Webb's Response: I won't say to much. However... I didn't realize until last night how captivating an orator this state elected. Before I proceed I would like to thank Sen. Webb and his family for their service in America's military. Everyone who serves in that capacity deserves our gratitude for those actions, including Sen. Kerry. However... Being a foot soldier qualifies no one to be an arm chair general, to assume that they always no better than the presiden and his advisors and can run this war. I am sick of people like Sens. Webb, McCain, Kerry, and Grahm who say, "I was a foot soldier thirty years ago. I'm an expert on all things military." In much the same way that I as a grocery clerk am not an expert on how to run a grocery store, Sen. Webb is not an expert on how to run a war. As a Democrat who opposes victory this is also a war he doesn't want us to win. These sure are tough times. Keep working hard for God and country. How Can Anyone Still Support Embryonic Stem Cell Research? WASHINGTON: A baby boy who as a frozen embryo was saved from the flood spawned by Hurricane Katrina in 2005 has been born in a hospital in the New Orleans area and named for Noah, who safely navigated the biblical flood. 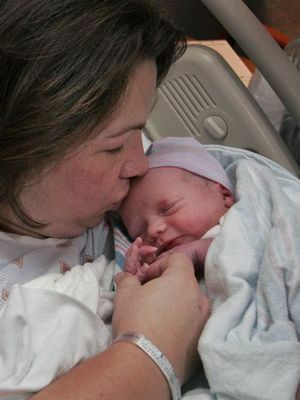 Noah Benton Markham was born on Tuesday in St Tammany Parish Hospital in Covington, Louisiana, a hospital spokeswoman said on Wednesday. He weighed 8 pounds, 6½ ounces (3.8 kg), and was delivered by Caesarean section with no complications, the spokeswoman said. His parents, Rebekah and Glen Markham, were unable to have children and created embryos at a fertility clinic to be implanted in the mother's womb. After the hurricane, authorities saved his embryo and others stored at a hospital where they had been in danger of thawing amid the flood engulfing the area. Baby Noah has a 2-year-old brother whose embryo was created at the same time but was implanted earlier. Embryonic stem cell research truly is murder. Every time a human embryo is used in the cause of science another Noah Markham is denied his right to life. Besides after twenty years of intense research, no positive results have come from the destruction of human embryos. Congressional debates over embryonic stemm cell research aren't simply debates over ethics. They are debates over whether the government will fund a form of research, that has never been proven to work, and simultaneously denies thousands the ability to see the light of day. I'm disgusted that our congress wants to encourage such destructive research. Many blessings on young Noah, and his elated family. So I was reading ManOnFire_89's discussion on marriage, and I thought, "I just heard a story about the sad shape of marriages these days, maybe I'll re-read it and post a link on his site." The story is printed by the truthful patriotic conservative NY Times and entitled, "51% of Women Are Now Living Without Spouse." http://www.nytimes.com/2007/01/16/us/16census.html?_r=3&oref=slogin&oref=slogin&oref=slogin The problem was that their 51% of women was of all women over 15. http://newsbusters.org/node/10205 If you are 15 or 16 I hope you aren't married. But why is this a big deal? The left is using stories like these to show that marriage is really ruining women's lives. Part of the NY Times story read, “For better or worse, women are less dependent on men or the institution of marriage,” Dr. Frey said. “Younger women understand this better, and are preparing to live longer parts of their lives alone or with nonmarried partners. For many older boomer and senior women, the institution of marriage did not hold the promise they might have hoped for, growing up in an ‘Ozzie and Harriet’ era.” As soon as marriage is "proven" destructive to ones life, what's to stop any type of relationship from occurring between any number of partners? What's there to stop these rlationships from raising children? Ugh!! As young people, let's commit that when we are married we will have marriages that others will see and ask, "how can I have a happy marriage like that?" It's a serious thing growing up. The French parliament has pulled the dangerous language from the bill. Thank you everyone for contacting the French embassy. French Homeschoolers need your support. NOW!! Imagine the U.S. Congress was about to pass a law almost eliminating homeschooling in America. You would probably act immediately. That's exactly what the small fledgling French homeschool movement is facing. If you have been blessed to be a homeschooler, and want other children to continue to enjoy those blessings. Please read the letter below and call the French embassy. If you have never contacted a government office before, don't worry. You can just read the script and add a couple of personal comments at the end. Please act now and help preserve the right of parents to educate their own children. HSLDA--French Homeschoolers Need Your Help Immediately!